Win your wedding with Crowne Plaza Hunter Valley. 2. Entry is open to all residents of Australia. All entrants must be over the age of 18 years old. 4. Promotion commences at 9am AEDST 24/02/2019 and concludes at 5pm AEDST on 28/09/2019 (“Promotional Period”). This is a game of chance and skill plays no part in determining the winners. Each entry will be included. Independent Scrutineer’s pick in relation to all aspects of this promotion is final and binding on all who enter and no correspondence will be entered into. 5. The value of the prize is based upon the contracted value of the venue hire, food, and beverage only. If an entrant’s wedding occurs before the competition end date, the contracted value of the venue hire, food, and beverage will be reimbursed. 6. 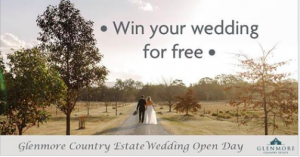 To enter, entrants must during the Promotional Period purchase and book a wedding through Crowne Plaza Hunter Valley or Glenmore Country Estate that is to occur before the 31st of December 2019 and the value between $10,000 to $30,000 AUD. 7. All entries must be unique to be considered valid. Multiple entries are not permitted. 8. Prizes, or any unused portion of a prize, are not transferable or exchangeable and cannot be taken as cash. 9. Prize winner must be over the age of 18 years old. If the prize winner is under the age of 18 years old, the prize will be redrawn. 10. If any prize (or part of any prize) is unavailable, the Promoter in its discretion, reserves the right to substitute the prize (or part of the prize) with a prize to the equal value and/or specification. 11. This promotion is in no way sponsored, endorsed or administered by, or associated with Intercontinental Hotels Group. 12. If this promotion is interfered with in any way or is not capable of being conducted as reasonably anticipated due to any reason beyond the reasonable control of the Promoter, the Promoter reserves the right, in its sole discretion, to the fullest extent permitted by law to (a) disqualify any entrant; and/or (b) to modify, suspend, terminate or cancel the promotion, as appropriate. 13. The draw will take place at Crowne Plaza Hunter Valley Lovedale Bar at 1pm on 30th September 2019. The scrutineer’s draw is final. The competition winner will be notified by 1st October 2019 via phone and email. any reason beyond the reasonable control of the Promoter; (d) any variation in prize value to that stated in these terms and conditions; (e) any tax liability incurred by a winner or entrant; or (f) use of a prize; or (g) arising in any other way out of the promotion. 15. Entrants consent to the Promoter using the entrant’s name, likeness, image and/or voice in the event they are a winner (including photograph, film and/or recording of the same) in any media for an unlimited period of time without remuneration for the purpose of promoting this competition (including any outcome), and promoting any products manufactured, distributed and/or supplied by the Promoter. purposes, including sending electronic messages or telephoning the entrant. Entrants should direct any request to opt out, access, update or correct information to the Promoter. All entries become the property of the Promoter. 17. The prize must be used before 31st December 2019 or the prize will be forfeited. 18. The Promoter is Crowne Plaza Hunter Valley.